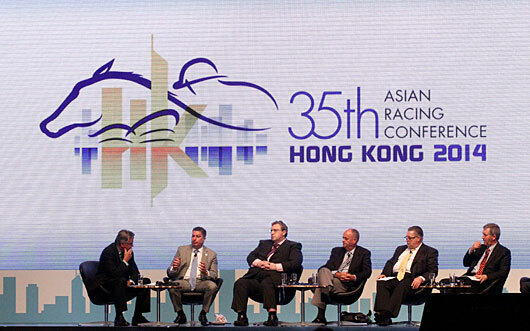 If there was a theme to the first full day of the 35th Asian Racing Conference, ongoing in Hong Kong, it might have been: Enlist government as your ally. The subtext would have been: Oh, but first get your act together and be successful. Panels discussed a broad range of topics, focusing on such as community impact, the international movement of horses, the future landscape for wagering (and regulation of wagering), and fair competition through drug control. 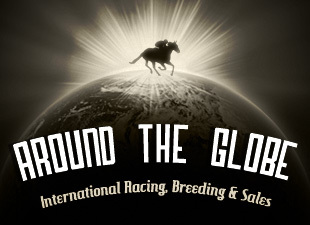 The ARC is organized under the auspices of the Asian Racing Federation, composed of 25 racing jurisdictions from Turkey and South Africa to New Zealand, Japan and Mongolia, which organizers credit with holding 40 percent of the world's races and 60 percent of its turnover. The organization also includes some of the world's most successful racing jurisdictions, such as Hong Kong, Japan and Australia. Cutting across economic success or lack thereof, many delegates at the May 6 session spoke of concern about capturing and returning to horse racing a fair share of revenue—and data—generated by wagering across all the new betting platforms. In England, for example, Paul Bittar, chief excecutive of the British Horseracing Authority, said the levy imposed on wagering operation in 1961 does not capture revenue from "remote" wagering platforms, which have proliferated. He also noted the Authority has no access to customer information from remote markets other than from Betfair, the international alternative wagering company that voluntarily signed a five-year agreement with British racing authorities. Customer data, he said, is vital for many reasons, including ensuring integrity. Phillippe Germond, Chairman and Chief Executive of PMU in France, said French wagering is doing well but faces challenges from saturation of the market and competition from other forms of wagering authorized four years ago. If, he said, PMU were authorized to conduct other forms of gaming, it would do so. And, he added, revenue from those sources " is also for the horse racing industry." Authorities from Australia and other jurisdictions chimed in with similar thoughts. Not surprisingly, countries where racing is thriving—and producing a significant revenue stream for government—seem to be doing better than their more impoverished brethren at getting government cooperation in solving their problems. Germond said PMU is optimistic about getting authorization to handle more forms of gaming. John Brumby, former premier of the state of Victoria in Australia, said racing has enjoyed bipartisan support throughout several government turnovers and works closely with state and national authorities on issues such as ensuring that racing gets its fair share of wagering profits. Even Bittar said English racing finds "a very supportive government at the moment." But he noted that government support is for legislation that not only would help the industry but also would extend the levy collection to offshore operators, which would mean a 15 percent tax on profits plus the levy, currently 10.75 percent. So even if racing isn't currently generating cash for the government kitty, cooperation can be forthcoming if it might do so soon. A panel on community involvement showed how racing can go beyond generation of tax dollars to create partnerships with government. Brumby noted that racing historically has been an integral part of Australian culture. He said events like the Spring Carnival, including the Melbourne Cup—the race that stops a nation—contribute not only financially but also to the spirit and "liveability" of the city. That spirit, he said, translates down to smaller communities that have the same regard for their local carnivals and "cup days." But, as the host for the meeting—in the Chinese "Year of the Horse", no less—it was Hong Kong's chance to blow its horn. 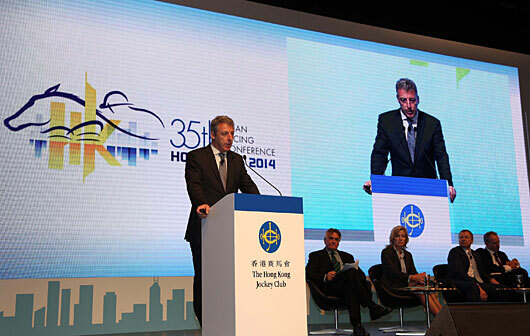 The Hong Kong Jockey Club, celebrating its 130th birthday this year, is a not-for-profit corporation that plows its substantial surpluses right back into the community. The Club enlisted a government beneficiary, the Hon. 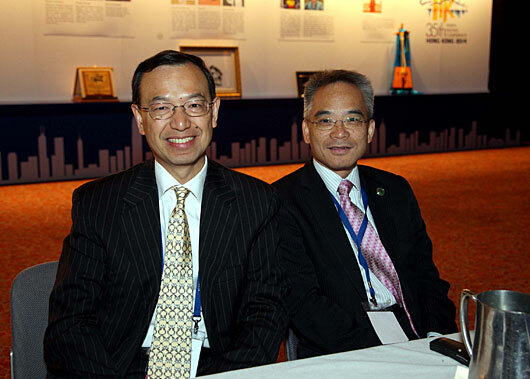 Matthew Cheung Kin-Chung, the Special Administrative Region's secretary for labor and welfare, to explain. 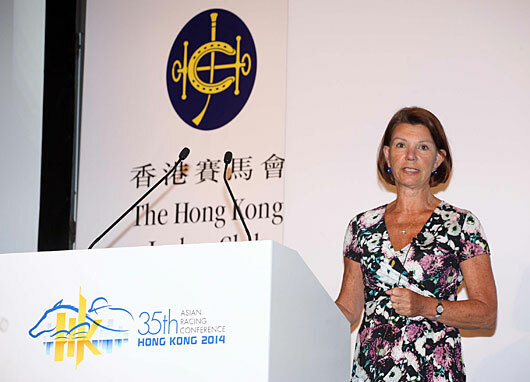 "Through tax revenue, the HKJC is the government's major social partner," Chung said. He elaborated: The HKJC is Hong Kong's single largest taxpayer, coughing up HK$17.6 billion, 7.3% of total taxes collected each year and about one-third of government recurring spending for welfare during the year. In addition, the club donates close to HK$1.9 billion a year to charitable causes, employs 24,000 people and maintains a 1,000-member volunteer team that "lend a gentle, human touch" to its social activities. Remember, that was a government official speaking, not the club. 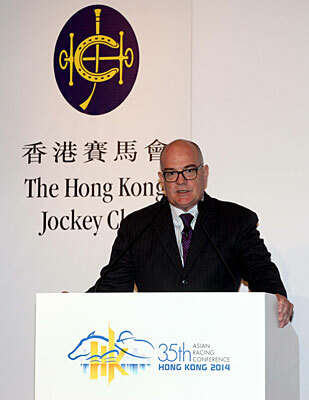 "The HKJC is omnipresent in Hong Kong," Chung said. "It has weaved itself into the local fabric." 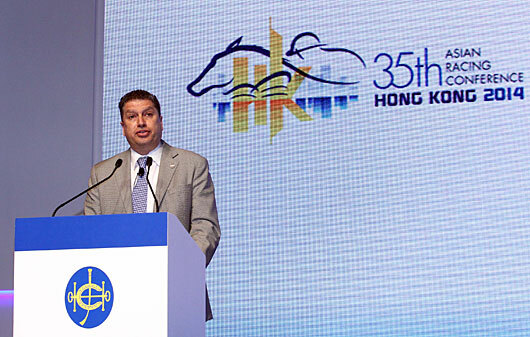 It could be noted that, despite that relationship, it took years for the club to win approval for co-mingled international pools—an approval granted last year that already has led to the import of the Hong Kong signal into the United States and other markets. Another area of interest to racing that will require some government support is easing restrictions on international movement of horses. A complex maze of national regulations currently impedes or delays the flow of equine competitors, in racing and other horse-related events. "These movements are controlled by national veterinary authorities," said Brian Stewart, head of equine welfare and veterinary service for Racing Victoria Ltd. and chairman of the Committee on International Movement of Horses for the International Federation of Horseracing Authorities. "They're inherently conservative and risk-averse...To make change, we can't just wish it to be so and we can't just force it to be so. We have to provide them with comfort that the decision to facilitate movement is going to be safe, that it will protect the horse population and that it will be based on science and not business." Efforts are under way and protocols are being developed for international accords, at least covering "major event" horse movement. But implementation will require some big-time relationship with regulators. 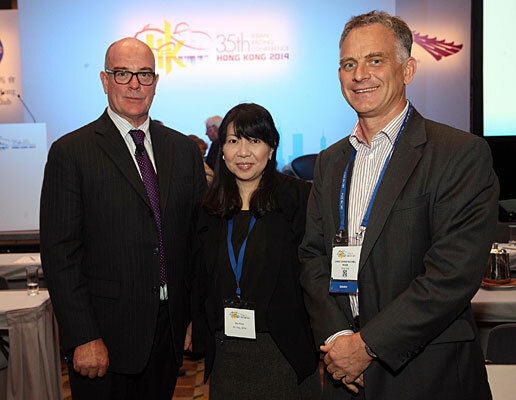 The Hong Kong meeting also provided the opportunity for the IFHA to conduct an executive council meeting, which approved a statement on medication and horse safety. The regulation provides for traceability of Thoroughbreds throughout their career and for out-of-competition testing for prohibited substances at any time. 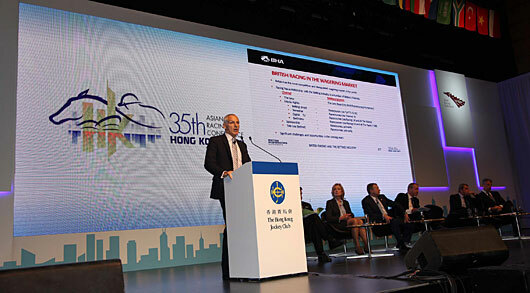 "While some racing authorities may face difficulty in accomplishing out-of-competition testing due to regulatory constraints or jurisdictional practices, it is critical that each authority examine its current drug control regulations and protocols to ensure out-of-competition testing is in place or begin steps for implementation," said Louis Romanet, IFHA chairman. 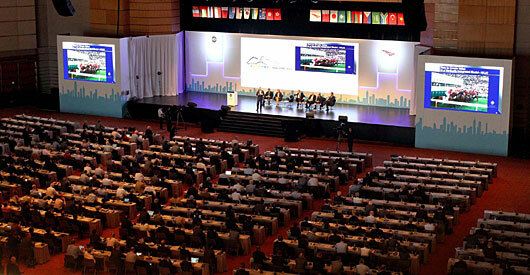 The draft was approved unanimously, with the vote including the United States Jockey Club.